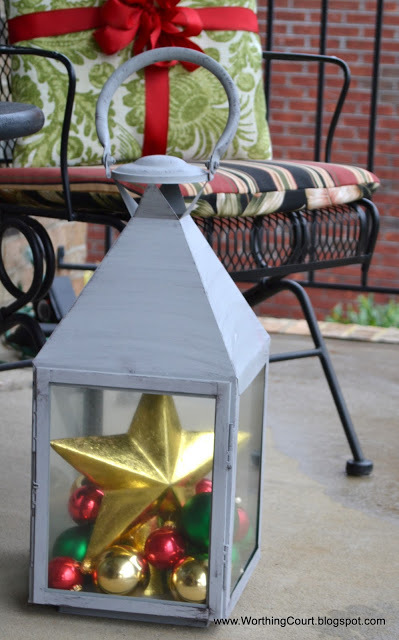 I’m having so much fun participating in all of the Christmas linky parties this week! I hope you’ll check them out. There is a lot of serious talent and inspiration out there. Tonight’s focus is on doors and porches. I took pictures last night and during the day today. My daytime pics aren’t that great though because it was a dreary, rainy day here. My wreath came from Caryl’s Christmas Shop a couple of years ago. I love all the glitz! I wanted my garland to be similar to the wreath, but not exactly like it.The garland is made of three cheapo ones wound together with about 200 lights added. 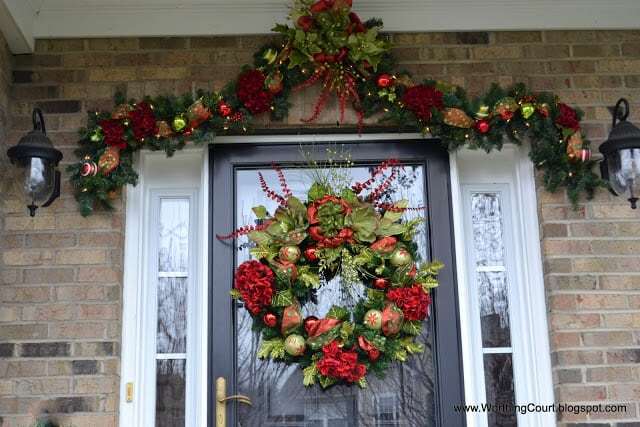 I was fortunate to find ribbon, picks and red hydrangeas that are exactly like what’s on the wreath. Following the tips offered by the designer at Caryl’s, I made and attached the bow, wound the ribbon through the rest of the garland and filled in around and behind the bow with with flowers and picks. Then, I started adding hydrangeas, ornaments and more picks – all the while keeping my eye on how things were distributed around the wreath. I’m pretty pleased with how it turned out! 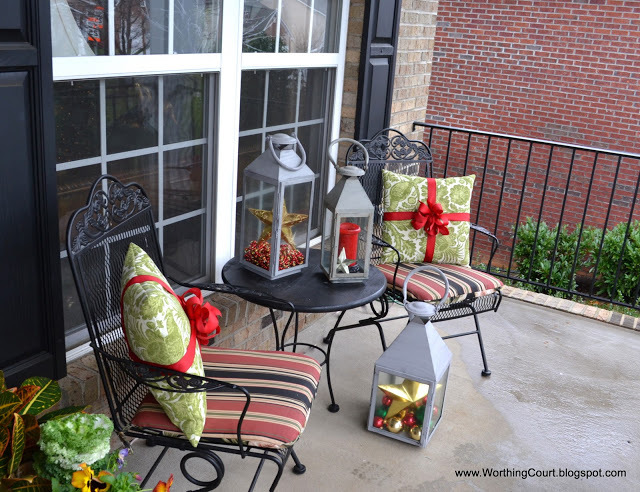 On the porch area that is off to the right of the front door, I added ribbon and bows to the existing pillows in the chairs. Wired ribbon is the bomb, y’all! The large stars in two of the lanterns are actually tree toppers. Here’s the view as you approach the front door. And lastly, here are daytime and nighttime views from the street. …and approaching from the other side. Now all I need are some Christmas Carolers to stop by! Wanna come sing to me??? 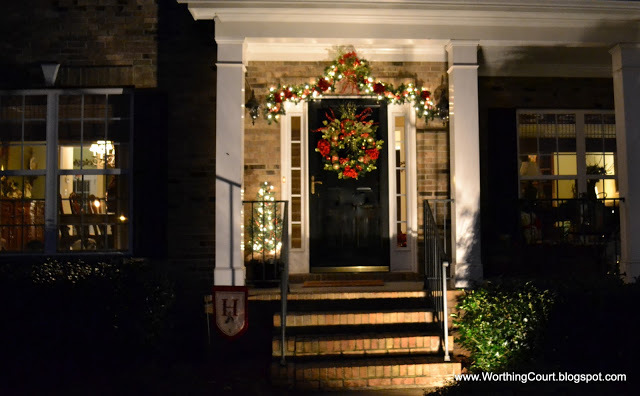 In love with your garland and wreath! Fab!!! 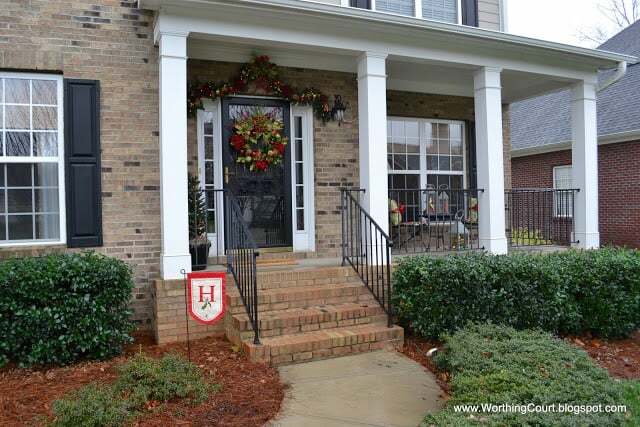 This is just incredible…your wreath and the pillows tied with a bow are perfect. Great photos too. Your home is so inviting! It’s so pretty all lit up at night. That wreath is gorgeous and you did a nice job with the garland. I like the lanterns with the stars and baubles, too. Thank you for sharing at my party! 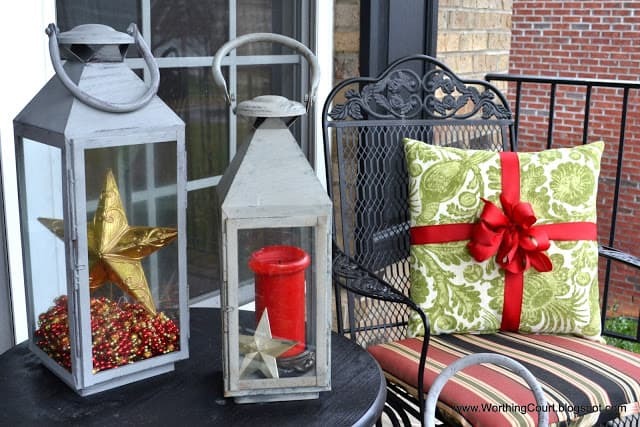 Your front porch looks so festive and inviting! I’m coming from HOH. You wreath and garland are gorgeous! 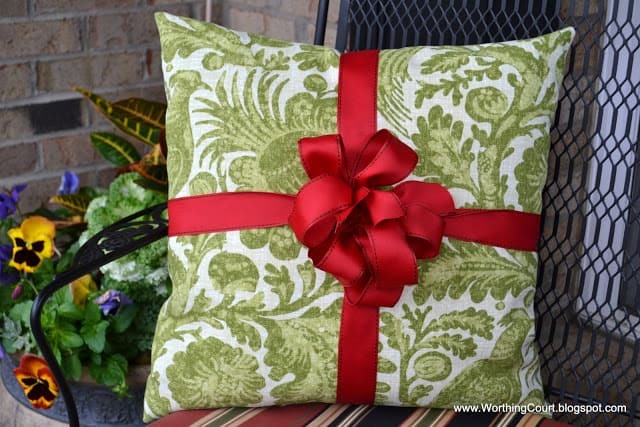 I’m totally stealing your idea to “wrap” the green pillows on my front porch. I’ll be doing that first thing in the morning! 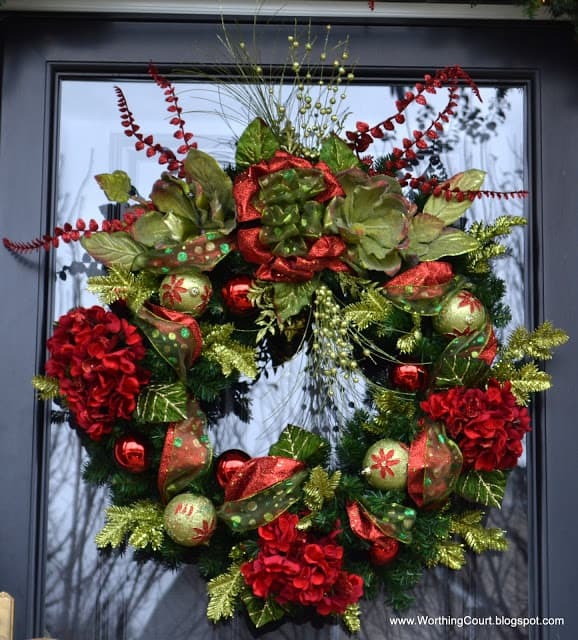 The wreath is gorgeous…and the pillow with a big gift ribbon is my favorite idea this week! I am going to have to steal this for my porch! Thanks for sharing and Merry Christmas! What a lovely home! The night photo’s are gorgeous! Your home is beautiful. Just the right amount of Christmas cheer. Beautiful! 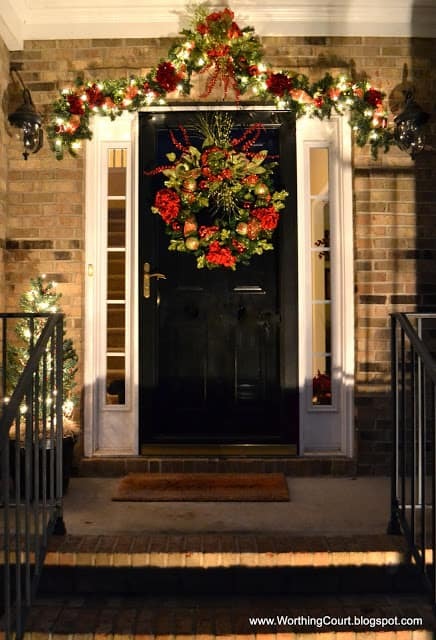 I love the garland above the door! What a wonderful idea! Oh my! 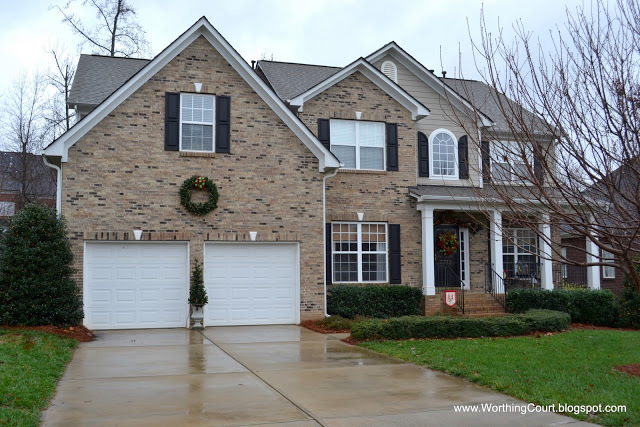 Your front door and porch are stunning! 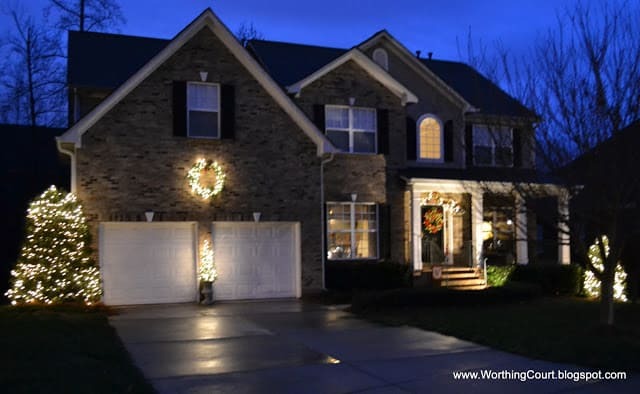 I love the your wreath and garland and the lighted wreath on the garage. It looks great in the daytime, but fabulous at night. Well done! Absolutely gorgeous. 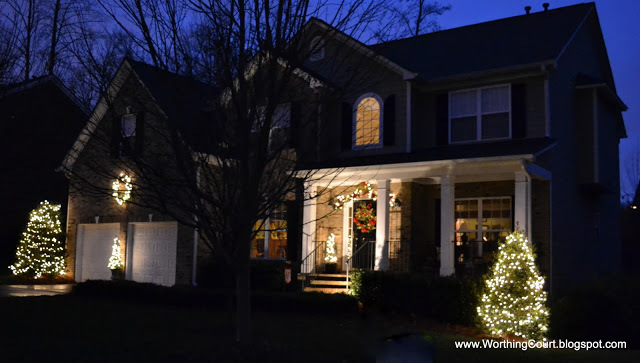 I swoon for that black door by night and I pinned that bow wrapped pillow to my pinterest holiday board. :0 Love love love it all. Consider yourself featured Sunday night on BeColorful. 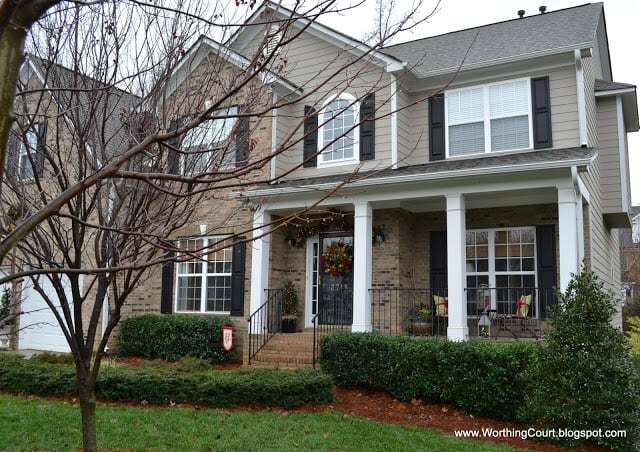 Your entrance, porch and door are beautiful and so inviting!